James Carter and Darren Forman along with Joystiq's Sinan Kubba and The AI Bots Dan Clark gather together to confer about Cavia's third-person action role playing game Nier, which was published by Square Enix back in April of 2010 for the Xbox 360 and the PlayStation 3. Cane and Rinse 111 was edited by Sean O'Brien. Interesting to hear the opinion that the father/daughter relationship is more played out and a less interesting trope than the brother/sister relationship. Although there have been a lot of games recently with the father/daughter relationship, I think it's generally not really a common theme in games. But the trope of orphaned siblings is a very played out trope in games, or more specifically Japanese media. As I said with my post on the other thread, I think the father/daughter dynamic fits way better and creates a much better and more complex story than the generic anime style relationship of the orphan brother/sister thing you see in so many JRPGs. I don't remember any reference to Kaine being a hermaphrodite though. I'll have to look that up. But that would explain some questions I had about her character. I was never really quite sure why she was discriminated against while she was still a child. And Emil falling in love with Nier? What? Looks like I'll have to investigate that too. I can see Kaine having a thing for Nier though. There are a few short shots in cutscenes that seem to show them sharing some sort of chemistry, like at the end of the game after the King sacrifices himself to the boar shade. That stuff about the lyrics in the soundtrack is really interesting too. I had no idea that it did that. Didn't know there were quite so many different versions of the soundtrack either. So yeah, great episode! Gave me a lot of stuff to investigate that I didn't know about the game. Great episode. I’m glad the panel was overwhelmingly positive compared to some of the gaming press who I feel missed the point slightly. I’m interested to know if anyone (panel included) has played Drakengard 3. 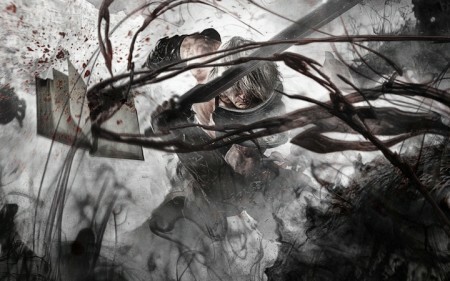 The critics seem resoundingly negative but I’m hankering for some more nier type bonkers before I play automata.